Everyone loves a weekend spent on the water. 1 in 10 American households owns a boat, and that number is only growing as the boating industry sees a comeback across the board. Boat ownership is a joy, but that doesn’t mean it is all smooth sailing, and one of the problems boat owners face is biofouling. Biofouling is the growth of microorganisms, plants, algae, or animals that build up on the underwater sections of vessels. This build up decreases a boat’s durability and efficiency. Antifouling paint works to prevent biofouling, protecting your vessel and your pocket. This article will outline the specific benefits of antifouling paint, describe the variety of antifouling coatings available, and take a look at the ever-changing regulations regarding biocides. We will also look at the companies that provide antifouling paint products, and where to find them in the US. The sheer volume of trade, travel, and recreation conducted on our seas and rivers shows our reliance on these waterways for much of our day to day life. The possibly harmful effects of this traffic on our marine environment cannot be overlooked, and this is driving the demand for effective, low cost, low impact antifouling coatings as part of a vessel’s complete coating system. 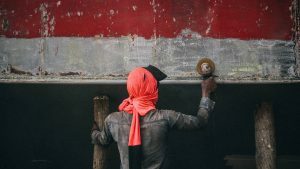 Traditionally, antifouling paints work through the action of a biocide – a chemical substance intended to destroy, deter, or render harmless, or exert a controlling effect on any harmful organism by chemical or biological means. The current biocide used in most antifouling paints is copper, with 90% of antifoul paints using copper or its oxide as their active ingredient. However there is a trend away from biocides, and new products are emerging on the market which use different properties to fight biofouling. The delivery mechanism for these types of antifouling paint is called ‘contact leaching’. The coating is packed with biocide, and contact with water causes these biocides to leach out. As a result, the antifouling protection is not constant – it starts out high, then wanes as the biocides leach away and all that remains is the hard paint film. These coatings also lose their antifouling ability if kept out of the water, so they cannot be hauled and relaunched without repainting. As the name suggests, this coating uses erosion to deliver biocides. This can be caused by the friction of the water passing over the hull, or by a chemical reaction which is localized at the surface of the coating. The biocides are released in a controlled manner, which provides longer and more consistent biofoul protection. Unlike hard film antifouling, boats painted with eroding antifoul can be hauled and relaunched without repainting, since the biocides are chemically bound to the paint and are only active in water. Recent developments and the global trend towards sustainability and “green” coatings is driving the study of alternative antifouling methods which do not require the use of a biocide. These include experimental surfaces such as Teflon or silicone coated, hydrophobic, and textured hulls which may prevent the biofouling from growing – known as foul release coatings. Foul release coatings include silicone elastomers, Teflon-based coating and fluoropolymer coatings, ceramic coatings, and wax coatings. They are known as foul release coatings because the mechanism does not prevent biofouling from settling, but instead the slipperiness prevents it from attaching. The action of the vessel moving through the water is enough to detach biofouling from its tenuous hold. Another type of antifouling measure is biomimetic coatings. The name comes from the Greek for “life imitating”, and these coatings look to the natural world for inspiration. Coatings that imitate the closely scaled skin of a shark, flocked surfaces that resemble plants, or hydrophobic coatings based on the water-repelling surfaces of the lily pad are all biomimetic coatings. Like foul release coatings they are not toxic to marine life. How much does the paint cost? Does the coating lead to greater fuel efficiency? What surface preparation is required? How often will it require repainting, and what cleaning procedures will be required? Prices per gallon is not an adequate representation of price when it comes to antifouling, there are many cost factors at work. The abrasion resistance is relevant for racing vessels, vessels on trade routes that might encounter ice, bumps, or scrapes, as well as ships that require polishing. Highly abrasion resistant paints include the hard film coatings, Teflon (and other foul release coatings), and ceramic coatings. Despite being roughly 1,000 times safer than the tin-based biocides (which were banned twenty years ago), copper is still a concern for the environment. The Clean Water Act standard for copper is 3.1μg/L in marine waters, but in many marinas or poorly flushed basins the copper concentration exceeds this. Studies have shown that a high concentration of biocides in an environment can have a serious effect on the growth, development, and reproduction of mussels, oysters, scallops, sea urchins, and crustaceans. The tide appears to be turning against copper. 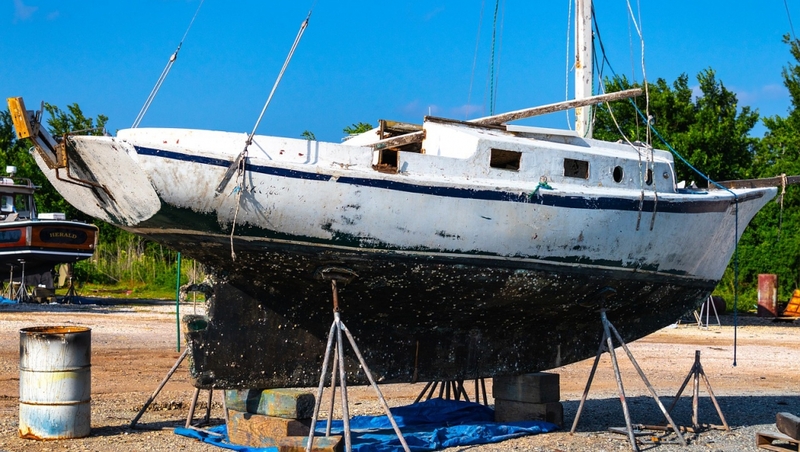 Washington state has enacted a ban for recreational boats on antifouling paints that contain more than 0.5% copper (effective January 1, 2020), and it is illegal to perform underwater cleaning of hulls with eroding antifouling coatings. California and the EPA are both conducting studies into the polluting danger posed by copper, and how to reduce it. In light of this, coatings manufacturers have been working to create copper-free antifouling coatings to be ready when the legislation changes. New coatings include biocide-free paints such as non-stick surface and ceramic hard coatings. There are multiple bottom paint brands available in the USA. The best choice of paint is the one appropriate for your boat material (fiberglass, metal or wood) as well as the environment in which you keep your boat (salt water or fresh). If you take your boat in both salt and fresh waters, use the antifouling paint for the environment in which your boat spends the most time. Brands available include Rust-Oleum, West Marine, Sea Hawk, Interlux (AkzoNobel) and Pettit. Price varies across products, but with the range available it is possible to find exactly what you are looking for. Many products are not available for retail markets, and need to be applied by professionals and shipyards. It is always best to consult with professionals when choosing an antifouling coating. Below is a table outlining some of the products available. If you would like more information, our experts are here to help. Just get in touch and we will connect you with one of our coating partners to secure a quote for your project. You can do this through our contact form by clicking the “Request a Quote” button at the bottom of this article. We will help you find the right coating solution for your needs.